White Horses Beach Studio im Montego Bay Club Condominium entlang des Hip Strip, Gloucester Avenue St. James im Herzen des Spaßes. Überbezahlen Sie nicht für die Unterkunft! Lounge an weißen Sandstränden, Rafting auf unseren exotischen Flüssen; Erkunden Sie Höhlen, Wasserfälle, Reggae, jamaikanische Küche und warmes jamaikanisches Willkommen. Ihr Zuhause im Montego Bay Beach Club ist der ideale Ort, um alles zu ermöglichen! Das Studio ist komplett mit allen Annehmlichkeiten von zu Hause ausgestattet und bietet Platz für bis zu vier (4) Personen. Ihre Anwesenheit und Entspannung ist alles was benötigt wird. * Waschmaschine und Bügelmöglichkeiten für Ihre Bequemlichkeit. * Privater Balkon mit seitlichem Blick auf den Ozean. Great location, nice apartment with nice balcony. Well-equipped, for a great stay in Montego Bay. I would definitely recommend., Host was contactable and everything I needed was there. Sean was an ideal guest. No hassle no fuss. She showed her appreciation for a well appointed Beach Studio in the heart of the tourist Mecca, Gloucester Avenue, otherwise called the Hip Strip. The left the place in great condition and I look forward to her next trip. 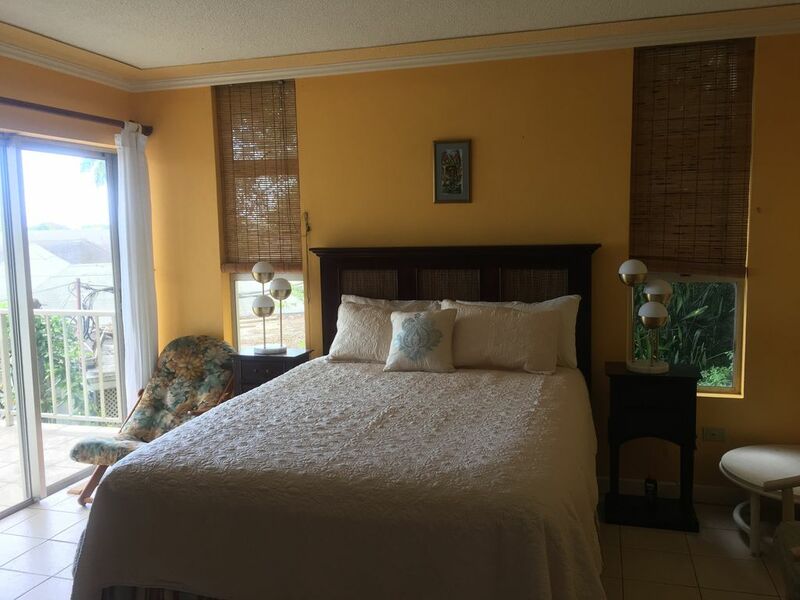 My friend and I decided to take a Spring Break escape to Jamaica and decided on trying White Horses Studio from the vrbo.com website to meet our budget and accommodation needs. We were delightfully and surprisingly rewarded. The Studio is spacious, inviting and accommodating and gave us 100% privacy as it was neatly and ideally located away from it all on the 4th floor. Audrey, the owner was easily reached and she ensured that we were at home by checking in on us while we were there. We loved the convenience of leaving our apartment and walking down stairs to the beach and Starbucks Café to have our morning coffee on Doctors Cave Beach. It was fun to run downstairs to buy and sample a bevy of fresh, tropical fruits from the fruit lady on the ground floor. On our way from the beach, we stopped by the mini-supermarket to sample and enjoy beef, Ackee, chicken and shrimp patties--I tried them all-- from Rasta's convenience supermarket located on the second floor. Another great plus for staying in this 4th floor studio, are the amenities. Literally everything is there for one’s home creature comfort and convenience. Also, a simple walk down the stairway to the 2nd floor enabled me to book a tour from the tour desk to Dunns River Falls. I also like the fact that I could take the elevator to the Penthouse level to splash or relax by the swimming pool. Even though all the amenities of home, were in my studio, we decided on foregoing the cooking and indulged in Jamaican cuisine by the Seaview Restaurant located on the top floor next to the swimming pool. I would definitely recommend White Horses Studio for a private, relaxing, incognito escape to Montego Bay .Staying at this apartment was indeed a relaxing retreat. We had everything for our convenience. The location is close to the beaches, airport, night club, bar, restaurants and souvenir shops. I highly recommend this studio apartment for a couple or a group of friends who are looking for an ideal, clean, comfortable, relaxing, well priced accommodation to enjoy Montego Bay and beyond. I’ll definitely be back.